Human eyes typically have three types of color receptor on their retinas, each sensitive to a different range of wavelengths of light. The colors associated with these wavelengths are approximately red, green, and blue. Because there are three types of color receptor, it is possible to map the visible spectrum in a three-dimensional spatial model by assigning red, green, and blue each to a dimension. It is then possible to outline a cube in this space, where the values of red (R), green (G), and blue (B) are visible on a gradient scale of 0 to 100% in their respective directions. 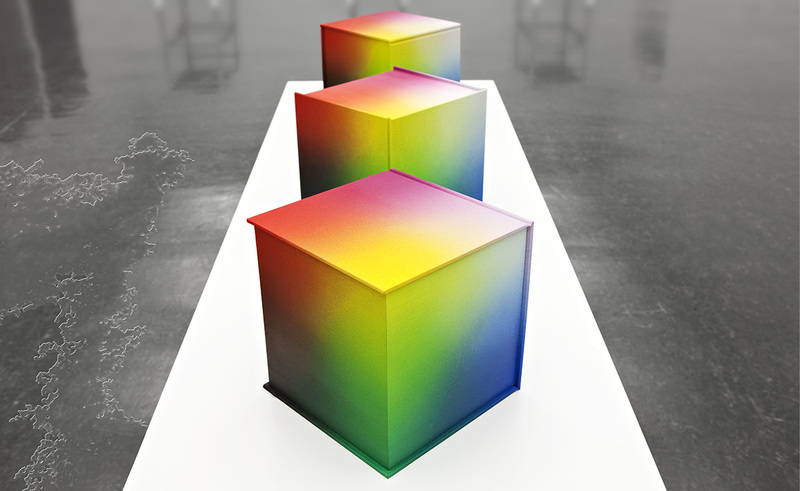 These gradients combine to create the RGB color space cube, a volume in which any color can be located by a set of three coordinates. 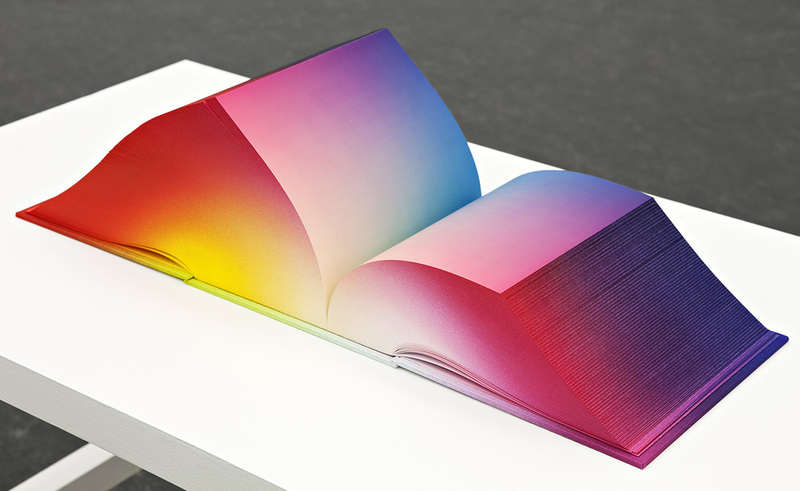 RGB Colorspace Atlas, both a sculptural object and spatialization of color, consists of three books. 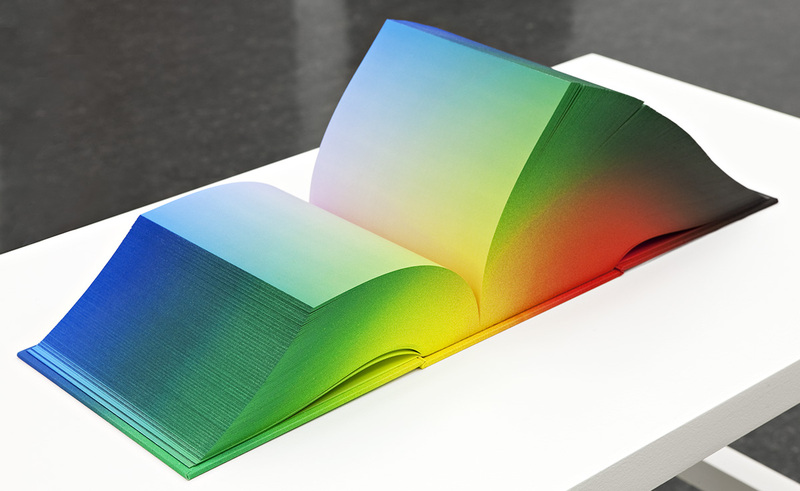 Each volume contains the entire visible spectrum mapped out over 3,632 pages, representing the RGB cube sliced in a different direction: vertically, horizontally, and from front to back. Binding co-designed by Daniel E. Kelm and Tauba Auerbach. The books were bound by Kelm assisted by Leah Hughes. The bookcloth and edges of the textblock were airbrushed by Auerbach. Printing by Bridgeport National Bindery, Inc.
Digital offset print on paper, case bound book, airbrushed cloth cover and page edges. 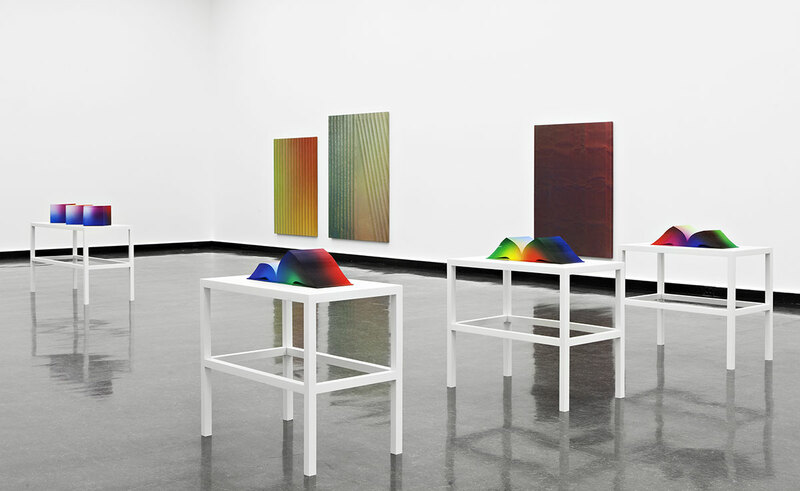 RGB Colorspace Atlas was included in Tauba Auerbach’s solo exhibition Tetrachromat, WIELS Contemporary Art Centre, Brussels, Belgium, March 22–June 2, 2013. The exhibition was initiated by Bergen Kunsthall, and is a collaboration between Malmö Konsthall and WIELS Contemporary Art Centre, Brussels. RGB Colorspace Atlas was included in the exhibition Ecstatic Alphabets/Heaps of Language, Museum of Modern Art, Special Exhibitions Gallery, New York, May 6–August 27, 2012. You may see an animation of the colorshift through the pages by following the link above to the exhibition’s web page. RGB Colorspace Atlas was included in Tauba Auerbach’s solo exhibition Tetrachromat, Malmö Konsthall, Sweden, March 17–June 10, 2012. The exhibition was initiated by Bergen Kunsthall, and is a collaboration between Malmö Konsthall and WIELS Contemporary Art Centre, Brussels. 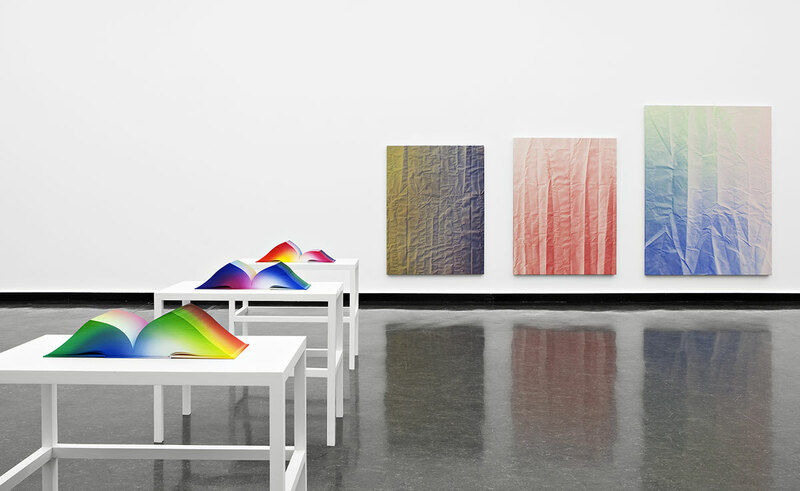 RGB Colorspace Atlas was included in Tauba Auerbach’s solo exhibition Tetrachromat, Bergen Kunsthall, Norway, November 11–December 22, 2011. The exhibition was initiated by Bergen Kunsthall, and is a collaboration between Malmö Konsthall and WIELS Contemporary Art Centre, Brussels. Note that the three books, Red, Green, and Blue, are aligned here to show the same colorspace, however, the spine is located differently from book to book. The books in the context of Tauba Auerbach’s exhibition Tetrachromat, Bergen Kunsthall, Norway. Another view of the books in the context of the exhibition. In order to generate the color shift through the pages, artist Tauba Auerbach worked with video programmer Jonathan Turner. An animation for each book was created with the same number of frames as book pages. The animation was essentially a fade between the first page and the last page, broken into 3632 incremental steps. The files were then output and the pages printed digitally. If you follow the link to MoMA found in the “where” section of this gallery, you may view the videos on MoMA’s site. The process of creating this 8-inch cube shaped binding is being documented and we will feature the production on this site in The Making of a Project. If you would like to be on Daniel Kelm’s email list and receive occasional announcements of content such as this being added to this site please email us at daniel.kelm@mac.com.